Thursday February 22nd 1883. I did up the work this morning and ironed a little that was necessary for Ott. I helped considerable with the dinner Hatt came over to eat the last dinner with the boys. We all went to town in the double buggy but Hatt did not go to the depot. The boarders and other friends were there. It was hard enough to have Ott go when it came to the final moment and he felt it as well as the rest of us. I stopped in town to make some purchases. George Day drove home for us. I sewed some in the evening. 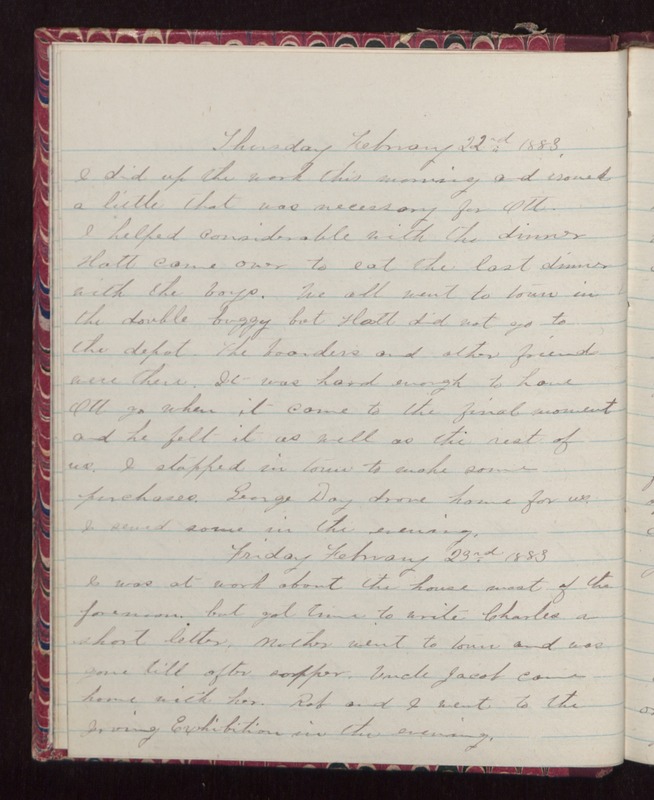 Friday February 23rd 1883 I was at work about the house most of the forenoon, but got time to write Charles a short letter. Mother went to town and was gone till after supper. Uncle Jacob came home with her. Rob and I went to the Irving Exhibition in the evening.